My cousin Laura asked me if I have ever featured Moleskin on my blog. 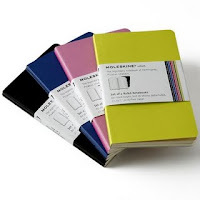 I am fond of (giant understatement) paper and am in love with the the newish Moleskin Volant notebooks; however, I don’t think I have ever mentioned my slight obsession with them. The horror! How have I failed to gush about such great paper? And, in such fun colors?